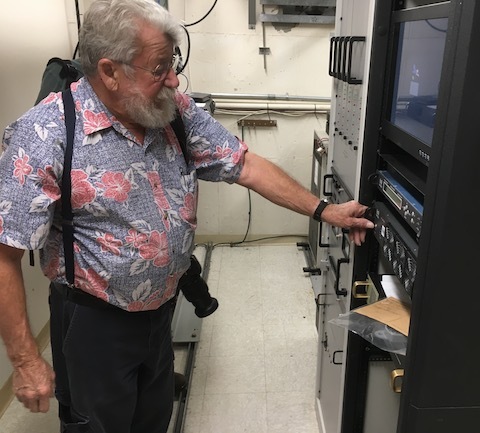 Sherman George, retired UCSD-TV Chief Engineer, pressed the RF button on their Anywave transmitter Wednesday morning, October 25th, 2017, to permanently end 27 years of public broadcasting from K35DG on Mt. Soledad. Sherman led the effort for the University of California San Diego in 1990 to start broadcasting television on UHF channel 35. For its leaving the air, the university just received a $24-million payment from the proceeds of the 600 MHz broadband spectrum auction completed this April. KTLA in Los Angeles will occupy channel 35 no later than April 12, 2019. UCSD-TV continues to appear on local cable and satellite distribution. UCSD-TV broadcasts a mix of professor and visiting scholar lectures, music performances, and even classic movies. They also uplink to satellite UCTV for the entire University of California system from the San Diego campus for distribution statewide on consumer and campus cable and satellite systems.